In a previous blog post, Dr. Fay Lewis explained the reason for UWE Bristol’s creation of the Children as Engineers toolkit, what it included and its success. And now we’re excited to announce that the collaboration between the UWE Bristol Department of Education and Childhood and Department of Engineering, Design and Mathematics run by Laura Fogg-Rogers with Juliet Edmonds and Dr Fay Lewis, has been shortlisted for an Inspirational STEM Engagement Project Award in the 2018 STEM Inspiration Awards. Funded by HEFCE, the project paired student engineers and pre-service teachers to undertake engineering design challenges in primary schools. Research shows that children (particularly girls) develop their attitudes towards STEM as a potential career before the age of 11, yet only 5% of primary school teachers have a science related degree. 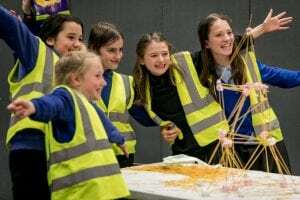 Children as Engineers aimed to improve teachers’ attitudes to science and engineering, leading to a positive impact not only on children’s performance, but also on their engagement and enjoyment. The project built on previous research funded by the Engineering Professors’ Council, Institution of Mechanical Engineers and the Institution of Engineering and Technology and supported by Mazak. Children as Engineers also developed a UWE Bristol undergraduate degree module called ‘Engineering and Society’. This pairs engineering students with teachers to bring hands-on science programmes into primary schools, aiming to address science, technology, engineering and mathematics (STEM) skills gaps in primary schools – for teachers and children. Winners will be announced at the STEM Inspiration Awards celebration event in the House of Lords on 1st November 2018.